I have a 6-month-old nephew and a 2-year-old nephew that I keep quite often, and getting them in the tub for a bath can be a nightmare!! 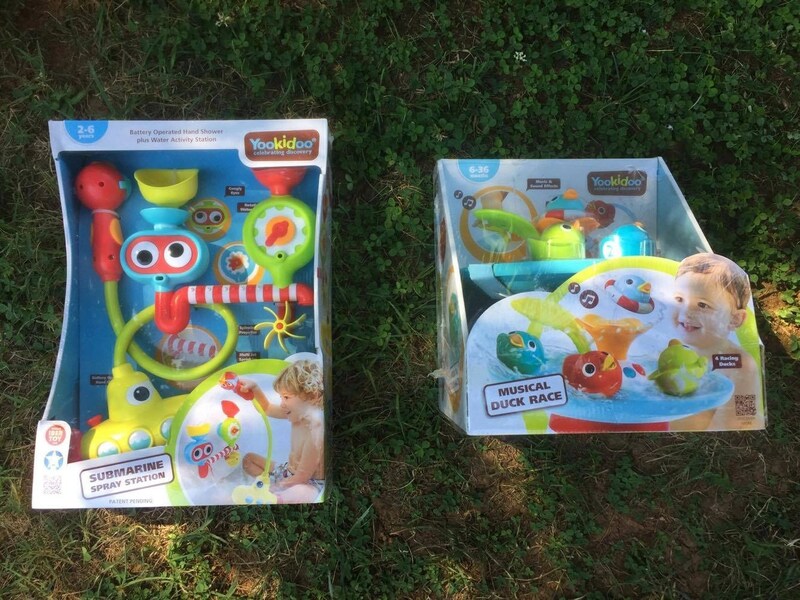 Yookidoo® bathtub/pool toys has made bath time not only something that they look forward to now, it has also made it fun for me and less stressful! 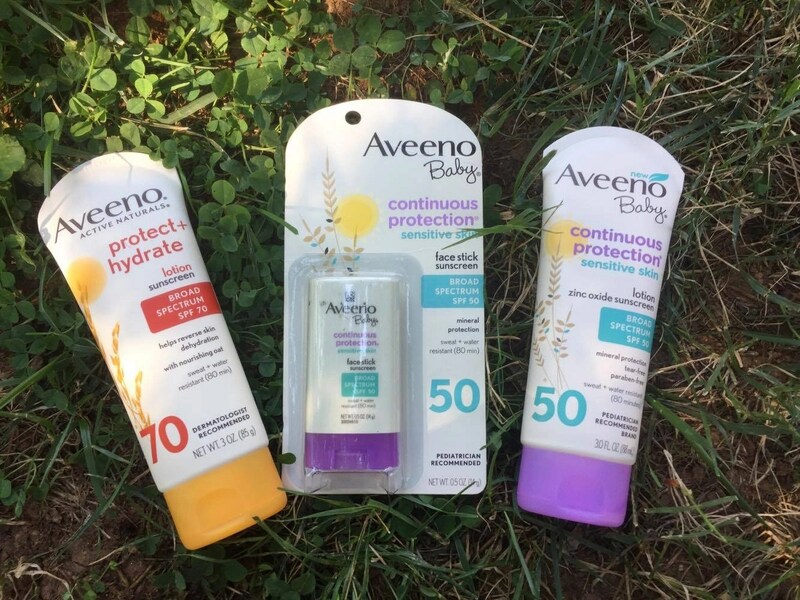 Sunscreen is a summertime essential no one should be without, Aveeno® is a pediatricial-trusted brand that is my go-to for stashing in my pool bag. 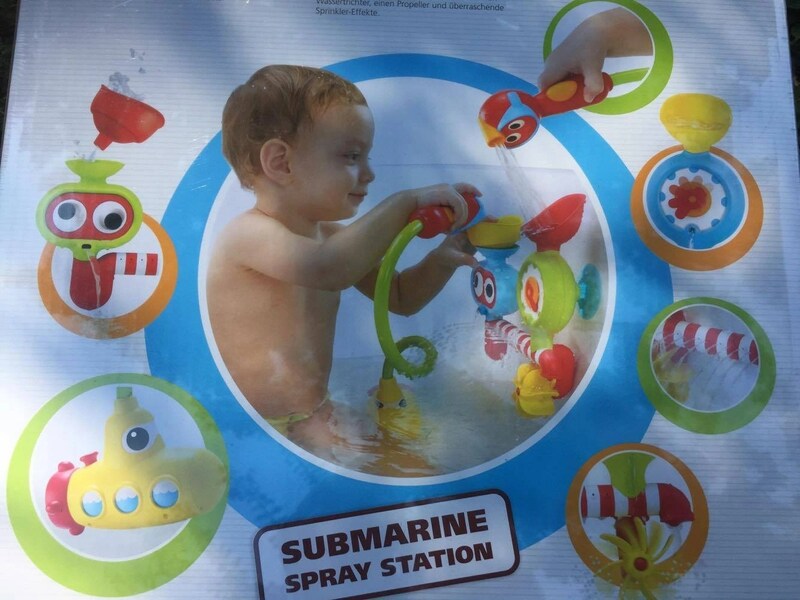 Yookidoo® is helping me make navigating bath time with my nephews an easier endeavor with the Submarine Play Station. My 2-year-old nephew absolutely adores this battery-operated hand shower and water activity station. It’s a best seller and won the Iber Toy Award in 2015 and also received the gold stars award. It takes water in from the tub and steams a flow through the head of the toy. It also features jet sprinklers and a rotating water gauge. I can use the hand shower part to rinse him off without using my tub’s large shower head. I love that it uses water from the tub so I don’t have to run any extra water or worry about the tub getting too full! 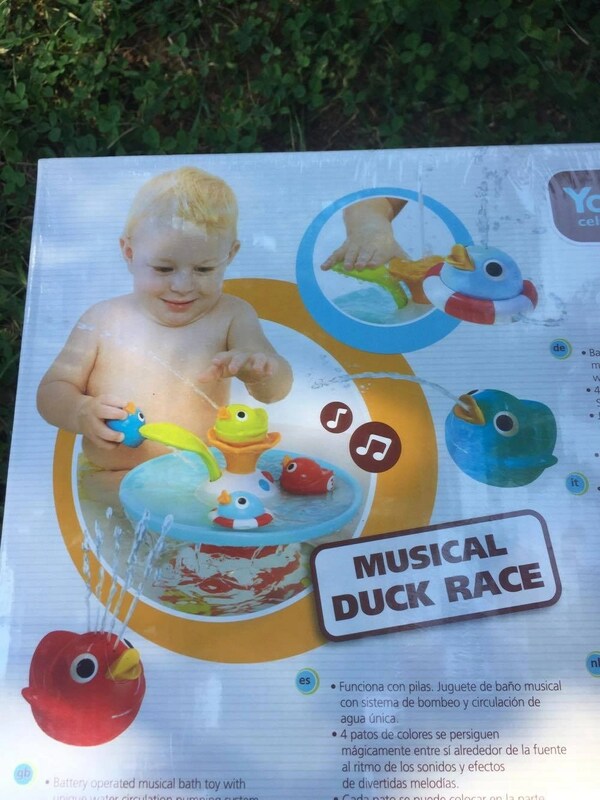 The Yokidoo® Musical Duck Race works better for my 6-month-old nephew and is made for children 6-36 months old. He really enjoys the music that plays while the toy is in operation. This toy also was a finalist for the international toy award in 2016. It is battery-operated and will cut off automatically after 3 minutes of not being used. It also uses the water that is in the tub and has 4 ducks that race and each one has a different way of squirting out water. There is a leaf lever that they can push that will play some very happy music and different water effects, too! Both of these are very affordable and can be purchased at Amazon and Barnes & Noble as well as other select retailers. They also work well in a pool or a splash pad! It made my nephews feel comfortable in the bathtub knowing that it was more of playtime instead of something they hated. 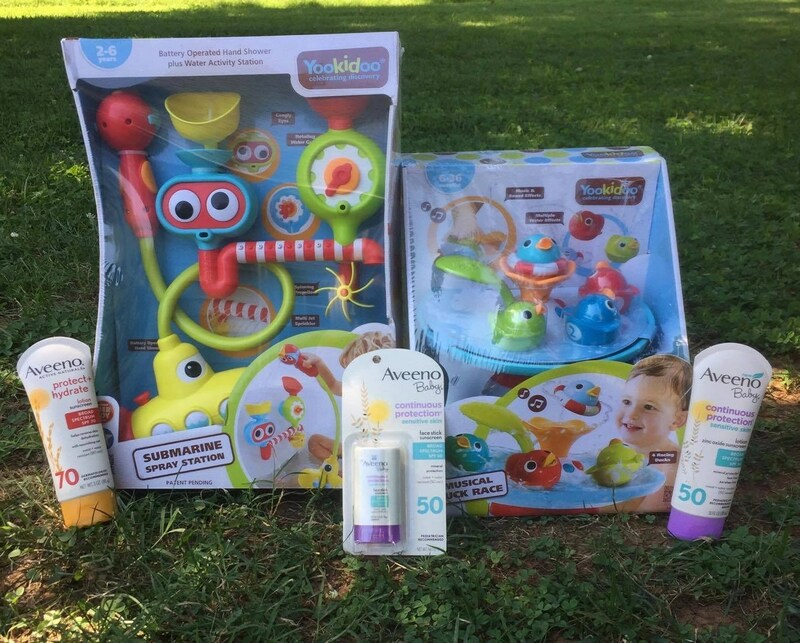 If you do decide to take the toys to the pool or the splash pad one thing that is so important today is to make sure your children and babies are protected from the sun with a safe and effective sunscreen. Aveeno® not only makes great products for adults, they also make a line for kids and babies. The sunscreens I like the best come in lotions and face sticks – and I prefer SPF 50 or greater. It’s also a plus when a sunscreen product is sweat- and waterproof for up to 80 minutes like these are! Aveeno® Baby Continuous Protection® Sensitive Skin Zinc Oxide Sunscreen SPF 50 is tear-free, paraben-free, and sweat-proof/water-proof up to 80 minutes. This product also features Active Naturals® Oat to soothe the skin (really important to me for small children). I also really like the Aveeno® Baby Continuous Protection® Sensitive Skin Face Stick Sunscreen because it’s easy to apply quickly while your little one tries to turn their face to avoid it. This is a pediatrician recommended brand which makes me feel safer choosing it. For us big kids (wink, wink) they offer Aveeno® Active Naturals® Protect + Hydrate Lotion Sunscreen in SPF 30/50/70. Aveeno® is a brand I trust to protect the whole family. 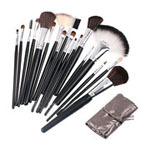 They are available at most drug stores, large retailers like Walmart and Target and on Amazon. For more information check out their entire line of sun protection products (including those pictured here). Even though summer is coming to an end it is still important to protect your child’s skin from the harmful rays of the sun. We all know that is the last thing on their mind while they are enjoying the outdoors so I appreciate this easy choice as a parent. How are you making the most of the last days of summer with your little ones? those tub toys look like tons of fun! My three-year-old, would love to go nuts with those! These are really cute bath time toys. I think our grandson would love these! I LOVE Aveeno products! And those bath toys look amazing – so much fun for little ones! The bath toys look like lots of fun for little ones. This is really nice, and the way it works it helps to ensure safety, too. 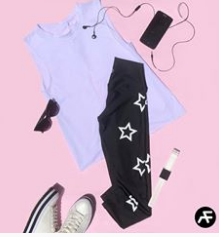 It would make a nice gift! There are some really great baby products here. I especially like the Aveeno® Active Naturals® Protect + Hydrate Lotion Sunscreen in SPF 30/50/70 and love that the SPF goes up 70. I love going for walks with my baby in the summer. We wish summer would last forever. I hate the cold!! Those are great products to keep the skin moisturized and protected!